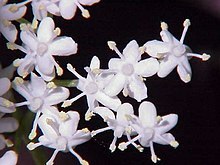 Sambucus is a genus o flowering plants in the faimily Adoxaceae. ↑ "Sambucus L". Germplasm Resource Information Network. United States Department of Agriculture. 2005-10-13. Retrieved 2009-07-23. This page wis last eeditit on 26 Apryle 2017, at 17:38.